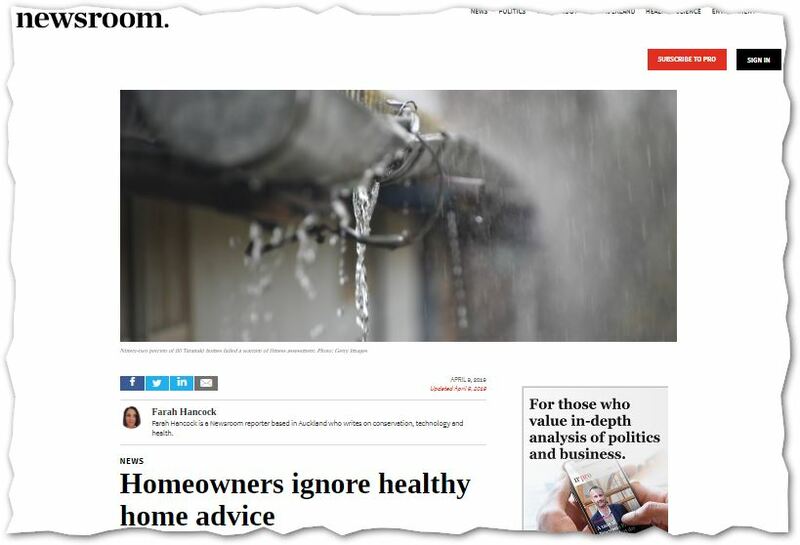 09 April 2019 Newsroom’s Farah Hancock: Homeowners ignore healthy home advice | Sustainable Engineering Ltd.
“ Homeowners understand the importance of insulation, but messages about other important measures which could make homes healthier aren’t getting through. For a home on an elevated crawl space where you can access underneath this is an absolute must do. Even if the ground looks bone dry the moisture rate from the (dry looking) soil can be almost as high as standing water. I’ve worked on homes which had moisture problems in the roof space and the solution was to put plastic sheeting under the house! Over half of the properties didn’t have a ground cover under the house. Literally this is the cheapest step you can take to make your home healthier & dryer. The original technical article is quite readable and important to understand how education of the general public will NOT be enough for them to fix up their houses – even if they KNOW it makes them sick and even if it is cheap and easy. Discussed in more depth here with links to the technical article.